Today I’m going to do my current favorites since I’ve been testing out many great products that really wowed me. I’ve two great makeup removers that I’ve been loving lately. I talked with this on my Instagram but this is the Laniege Lip & Eye Makeup Remover which I’ve been so obsessed lately. I just thought like this makeup remover is the one. I brought this with me during my vacation and it’s like the best thing I’ve ever use whenever I need to remover my makeup. It’s my favorite favorite favorite makeup remover. I recommend it to everybody! Next is the BB Cushion Hydra Radiance in the shade beige by Laniege. You can find this available in six different shades from porcelain to cacao. I don’t know why I love this so much but I just love it. I love this BB cushion because it feels lightweight, comfortable and hydrating on my skin, not to mention the coverage is simply amazing and with no buildup. Goals! I’ve to mention the Rodial Dragon’s Blood Cleansing Water because if I had to repurchase all my skincare, like this would be what I’d buy. The price is not overly expensive, cheerful and it works. I really like it and the scent is insanely addictive! It’s so good! Moving on is this old charm that was highly raved over the internet awhile ago but I only happened to have pick it up at Marshalls recently. I heard so many good things about this palette and really happy to finally add this into my makeup stash. I’ve been reaching for this Too Faced Semi-Sweet Chocolate Bar throughout my trip in Toronto and again since I got back. It’s safe to say it’s my current favorite go-to everyday palette. The chocolate scents smell so good and should I say addictive! I mean … it has real cocoa powder in it … what’s not to love!? The shades are super soft and highly pigmented. I’m impressed by how easily they blend. So effortlessly!!! In case you didn’t know, this product is cruelty free! The texture is very soft and so easy to blend out. You can never go wrong with Too Faced eyeshadows! If you haven’t already, you’ve to try it! This may not be makeup related but I’ve to mention it because it’s the best gift I’ve received this month. I got this handmade bag as a gift from my lovely sister-in-law when she was in Borneo, Sarawak. What a skillfully hand-weaved bag made by the women of Penan tribe! You can see a lot of love and passion poured into making such intricate bag. It’s my first time seeing this cute design and bright color bag. Such a beautiful color that just scream summer to me! A big shout out to Polly for this wonderful gift! I adore it! Best timing ever to arrive at my doorstep. Needless to say, I brought it with me to my Toronto trip last week. It holds all my makeup essentials and tons of other stuff too. So practical and durable quality. I think it was the best decision to bring for travelling. Yes, I actually took a lot of photos during my trip so definitely make sure to check my other blog if you want to see what I got up to while I was out there! I’d love to know how’s your summer’s like? Leave me a comment and let me know what’s on your radar the next couple of months. Thanks so much for stopping by and read. Disclaimer: I only work with brands I love, so thank you for helping me to support them. I received these products for free (*) in exchange for sharing my experience, all thought and opinions are my own. The products shown in this blog post were sent to me for consideration. The post is not sponsored. I’m always on the prowl for a good eye make up remover–will keep a look out for this one! Nice collection of favourites here! I like the Rodial’s dragon blood one. If it was here, I am pretty sure, I would have given this to my favorite girl. So that, I have a reason to be always near her. My favorite eyeshadow palette right now is the Box of Crayons Palette from the Crayon Shop. I love it so much and it is so much fun to create a lot of different looks. Thanks for sharing your favorites! I love laneige products and they do really make your skin feel fabulous. I haven’t worn makeup in months, crazy I know but hopefully soon I will. These sound like some great stuff. I like the bag too! So pretty. What amazing colors. That BB Cushion looks great, I really like products like this. The handmade bag you received is gorgeous, I would love to have that! I’ve heard good things about Laneige but I have never tried any of their products before. Looks like I need to! I think you’ll adore this product! Your makeup gpodies are nice especially the Laneige. And i like more your handwoven bag. Its gorgeous and useful. Thanks so much! Laniege has really amazing product. I love Rodial Dragon’s Blood Cleansing Water. My mom loves it too! I used to recommend this to all my friends and they all liked it! The Too Faced Semi-Sweet Chocolate Bar is my FAV! I actually own two lol. I absolutely love all the shades in your eye shadow palette. As someone who prefers softer and darker shades, such a palette would be fine for me. I am loving that eye palette! The colours look so amazing … I need it in my life ! I’ve been curious about trying Rodial’s cleansing water! Sounds like the perfect gentle makeup remover. Thank you! for sharing these awesome products. Especially loved that handmade bag. 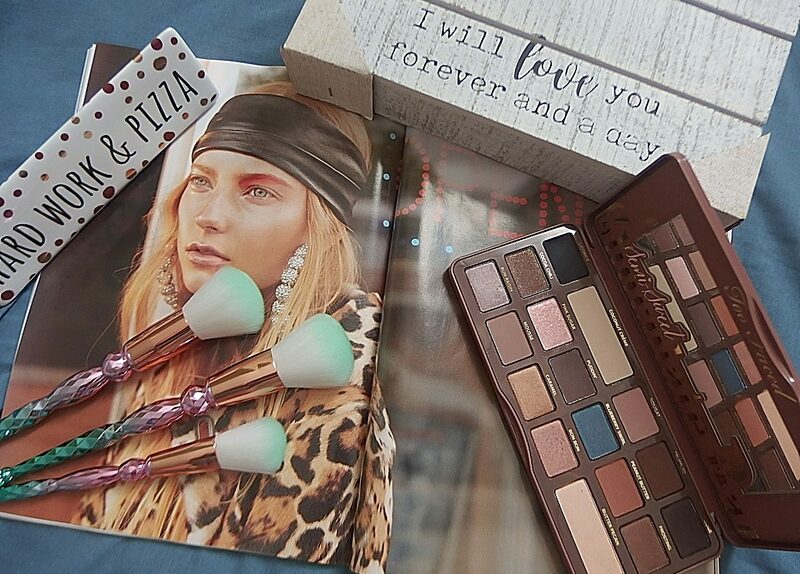 I definitely Want to include those chocolate eye palette into my makeup stash.